Aim to arrive 15 minutes early to be seated. The earlier performance is generally less crowded. We are comparing Flamenco Show at Café de Chinitas Prices from leading ticket suppliers and Try to find you Cheap tickets prices on the market. Operating since 1970, traditional flamenco shows take place inside Café de Chinita's beautiful 18th century mansion with brightly coloured Arab-style tiles inspired by Granada's Alhambra giving this venue a very traditional ambience. 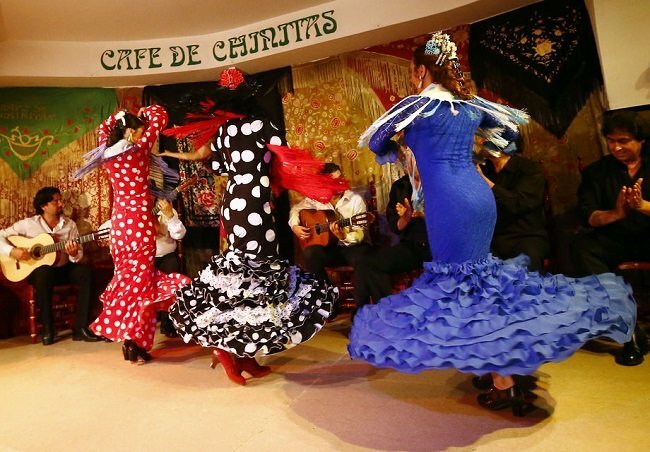 A number of renowned flamenco artists have performed at Café de Chinitas over the years including the legendary Rosario as well as Tomas de Madrid, La Chunga, Maria Albaicin, and Carmen Mora to name just a few of the artistes. Well known and loved guitarists and singers have also graced Café de Chinitas including Jose Merce, Victor Monge "Serranito", and the Carmona brothers who are better known as "Los Habichuela". The venue still welcomes top talent through its doors and is proud to showcase and nurture the best young talent around so you can always be assured of a memorable performance by the best and most passionate dancers, singers, and guitarists in the business, many of them using the tablao to launch themselves into the international flamenco world. A superb setting to experience an enjoyable night of passionate, authentic flamenco. A must-see if you have yet to experience a live flamenco show. Perfect for couples wanting to enjoy a romantic evening out but also suitable for groups. Your Experience With Flamenco Show at Café de Chinitas? Enjoy an evening of live entertainment as you watch authentic flamenco being performed by a passionate and talented group of performers. There are 2 shows each evening, the earlier performance is at 8pm, the later at 10pm. The internationally renowned dancers, guitarists, and singers perform their own choreography with improvisations to ensure every dance, and every night, is a little bit different. As you sit and admire the graceful movement of the female dancers in the beautiful flouncy dresses and immerse yourself in the soulful dance of flamenco you can enjoy a complimentary drink of sangria, wine or beer (non imported brands only). Dinner is also available as an add-on option when booking your ticket – If you have chosen this you will be served a traditional Spanish meal starting with olives, bread and salad followed by paella and finished off with a tasty dessert with sangria or coffee. The performance takes place in the heart of Madrid city centre at a beautiful 18th century mansion, the group perform their traditional flamenco to a backdrop of brightly coloured Arabic/Moorish tiles for a truly authentic feel. What Flamenco Show at Café de Chinitas Includes? A traditional flamenco show lasting approximately 1 hour performed by renowned artists who are passionate about putting on a fabulous show. A complimentary drink of sangria, wine, local beer or a soft drink. A traditional Spanish dinner if you have booked this extra option – Enjoy olives and bread with a salad and paella, a dessert, and more drinks. Please note that the venue does not serve imported brands. Authentic flamenco performed by internationally renowned singers, guitarists and dancers. Performed in an 18th-century mansion decorated with traditional Arabic/Moorish tiles in the style of the Alhambra in Granada. People who have booked the meal option should arrive from 7.30pm for the earlier performance. Those who have booked the show + drink general ticket should arrive from 7.45. The earlier you arrive the better table you will get! The 10pm performance may start late, on the plus side it may also go on far beyond the scheduled hour if the dancers are in the mood! Travelers Reviews about Flamenco Show at Café de Chinitas? Visitors talking about this tour on TripAdvisor, Viator, and Getyourguide are, overall, very pleased with the flamenco performance and would highly recommend it to others, saying they had a fabulous evening. Others use the words 'Wow', 'Amazing', and 'Bravo' to sum up their feelings. A few people were unhappy as they could not see well from their table and had to stand. Instant confirmation when booking online. Printed tickets and e-tickets accepted on the door. Arrive 15 minutes before the scheduled time to get seated and served.